The Olney House is a new 2-bedroom vacation rental suite that opened to visitors in May 2018. 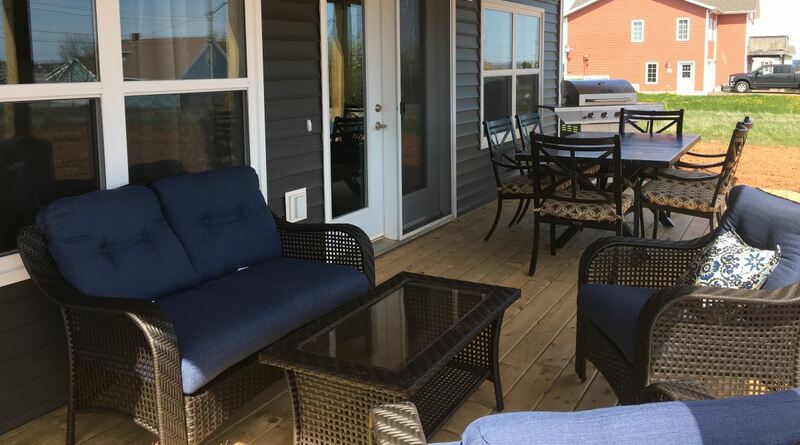 The vacation suite sleeps up to 6 people and includes all of the amenities needed for a relaxing PEI vacation. The Olney House is located in the scenic seaside town of North Rustico, PEI. From the house, it is just a 5 minute walk to a supervised National Park beach and a short walk or drive to restaurants including Blue Mussel Cafe and Fishermans Wharf Lobster Suppers. Just steps away from the house, there is a beautiful boardwalk along the North Rustico harbour that leads to the Seawalk Park and shops. In the immediate area, you can enjoy activities such as deep sea fishing charters, kayaking, paddle boarding, cycle rentals, concerts in the park, and plays at The Watermark Theatre. A grocery store, liquor store, gas station, more restaurants and shopping are close by… just 2 minutes away by car. Doiron’s Fish Market is open daily supplying fresh fish and seafood. Fresh baked goods are available at the Olde Village Bakery and The Yellow House. Artisanal cheese can be purchased at Ferme Isle Saint Jean Farm, also in North Rustico. For golfers, Andersons Creek, Green Gables and other golf courses are within a 10 minute drive. Cavendish attractions including Green Gables Heritage Place and Shining Waters Family Fun Park are 10 minutes away by car. It is a 30 minute drive to Charlottetown. We look forward to welcoming guests to The Olney House. You can book with us by phone or email. Views of the Gulf of St. Lawrence and the North Rustico harbour from The Olney House deck. Close to restaurants, fresh food, beach, local theatre and more. Steps away from the boardwalk along the North Rustico harbour.